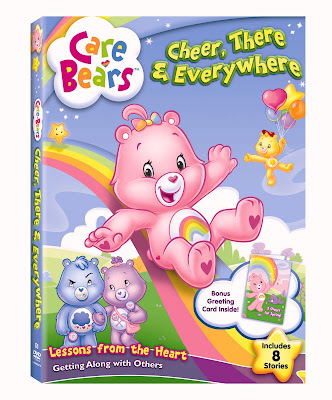 In Lionsgate Home Entertainment's first release of the 1980s smash children's series Care Bears-- which was recently launched as a brand new, fresh, and vibrantly animated television show for CBS-- eight roughly ten minute mini-tales are served up in this fun and accessible kid-friendly DVD. Similar to the stellar DVD releases served up by DreamWorks with Shrek the Halls and Kung Fu Panda which gave children control of the experience, this disc takes it a step further also utilizing a Walt Disney-esque fast-play option (most recently used to excellent effect in Lilo and Stitch). Moving right into the presentation of all eight episodes back to back in its eighty-eight minute running time with the Direct Play feature, the DVD also boasts a creative "Belly Badge Matching Game," that invites children to get in on the action and process what they've just seen in the disc's tales that emphasize working together, empathy, compassion, understanding, and friendship all embodied by the characters' memorable belly badges. Thematically tied in with the Spring season with episodes that center on new flowers in bloom, a talent show, and more in its adorable hot pink colored box protected by an outside cardboard case-- the DVD includes the following titles: "Growing Pains," "King Grumpy," "Cheer, There and Everywhere," "A Case of the Grumpies," "Gobblebugs," "Grizzle-ized," "Two of a Kind," and "Stand Up and Cheer." With its devotion to promoting the idea of-- as Lionsgate describes it-- "emotional intelligence," the sunny, fast-paced, upbeat, and extremely colorful, lively animation all made far more contemporary with a rockin' theme song and a style that melds the classic Care Bears from the '80s in a way that resonates today. As the Care Bears must work together to save The Gathering Tree in Care-a-Lot from the threat of Gobblebugs, negotiate mini battles of jealousy when Cheer and Share find themselves competing for attention regarding their beautiful gardens and the always surprisingly charismatic Grumpy stars in three of the most successful tales (from a storytelling standpoint) as he takes advantage of the kindness and guilt of his robotic sidekick Wingnut and works continually on his new inventions, we're always reminded that teamwork is the most important underlying message. Wholesome and morally inspiring yet thankfully without ever preaching to kids in a way that they could see-through in a moment-- it's the type of preschool and early elementary age DVD that actually engages kids to begin trying their hand at amateur problem-solving as they attempt to mediate the mini-problems faced by the Bears. Additionally, it does so in a way that suits the same highly successful format of Nickelodeon's slightly older-skewed series' SpongeBob SquarePants, The Mighty B!, Wayside School and others by knowing that the best way to entertain is in succinct spurts of plot that never last more than a dozen minutes before moving onto the next situation to help satisfy even the shortest and youngest attention spans. Highly recommended for young children and filled with bright animation that's definitely in the same league as feature-length work-- while '80s babies may yearn for the same "Care Bear stare" vintage tales from their childhood, soon they'll be converts in no time with this first-rate disc from Lionsgate which also offers a limited edition Spring themed greeting card to tie in with our current season and also the setting of the DVD's episodes.